The science behind a foggy car window is actually quite simple. When there is a difference between the outside and interior air temperature, moisture gets deposited on your car windows. That’s why during winter months when the temperature drops, you’ll notice more condensation on the inside of your car. Conversely, when it’s hot and humid outside and you put on the air conditioner, you’ll notice that the exterior windows fog up. Annoying? Yes. But thankfully there are ways to combat it and get your windows back in the clear. Sweaty Gym Clothes. Umbrellas. Ski Boots. What do all of these items have in common? They carry a lot of moisture with them that will make your car windows fog up. If possible, put these items in the trunk before driving. Also, if you’re coming into your car from the snow, give your feet a few claps together before entering the vehicle to clear away any excess. Another culprit to foggy windows are your car mats. Inevitably they will get wet during rainy days, but do your best to limit the amount of moisture they take in. This is especially true if you’ve recently detailed or cleaned your car. If there is any residual water or chemical formula on the mats still you may encounter a bit of fogging as they dry out inside your vehicle. 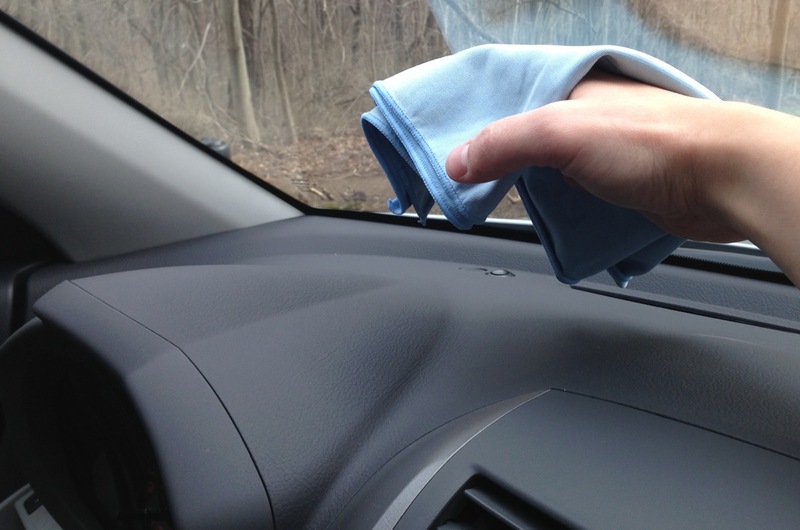 Keeping your car’s windows clean helps prevent moisture from sticking to the surface. cleaned and protected to minimize fogging. Car window cleaning products come in many different varieties. Try selecting one such as Eco Touch window clear which is free of ammonia or alcohol. Next, add a layer of protection which will help keep moisture from settling on the surface. We suggest Eco Touch Quick Wax since it safe for all glass and window surfaces. Use sparingly and buff with a dry microfiber towel for best results. Spring is almost here, and you know what that means…cleaning. Your car has probably accumulated its fair share of dirt on the inside and outside. We’ve put together some of our most popular tips to help get your vehicle back in shape for the warm days ahead! Keep the dish soap under the sink! Dish soap should never ever be used to clean your car’s paint as it strips waxes and other protectants from your vehicle’s finish. This will leave your car completely unprotected and exposed to the elements. Instead, opt for a Waterless Car Wash such as Eco Touch that safely cleans and protects your paint in one easy step. Avoid washing your car in direct sunlight. Car wash products need time to work on the surface and remove contaminants. Otherwise you’ll end up with unsightly streaks. Try washing in the shade, early morning, or evening hours when the sun isn’t at its peak. Ditch the old t-shirts and cotton terry towels as they can damage your vehicle’s finish. Instead, go for microfiber towels. These cutting-edge towels contain thousands of tiny ‘scoops’ that safely lift dirt from the surface and help ensure a scratch-free finish. One example is the Eco Touch Microfiber Towel Pack for $6.99. Avoid the ammonia and alcohol-based window cleaners as they can damage tinted windows and leave you gasping for breath. There are many solvent-free cleaners on the market today engineered specifically for cars. Eco Touch Window Clear is a sovlent-free formula which retails for $7.49. Give your console a little love. If you’ve neglected the dashboard start by cleaning with an all purpose cleaner to remove dirt and grime. Once the surface has been wiped and dried, you need to re-nourish it with a protectant. Make sure you spray the product on a towel first to avoid splatter on the inner-windshield. Try Eco Touch All Purpose and Dashboard Protect. Opt for a low-gloss protectant to help reduce glare while driving. The last thing you want is your dashboard acting like a mirror while driving down the highway. Don’t forget those vents! Dip a q-tip in a bit of protectant and apply to the vents to help reduce dust build-up. Not all carpet cleaners are created the same. Some contain nasty chemicals such as nonylphenol ethoxylates , glycol ethers and petroleum solvents. Spray these in your car and you now have a car full of toxins waiting to be inhaled. Instead, try a natural carpet cleaner such as Eco Touch Carpet + Upholstery – powered by a soy-based solvent.